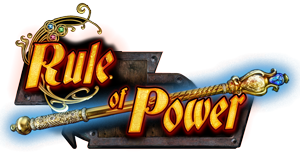 Rule of Power is a highly addictive fishing card game richly endowed with overwhelmingly beautiful illustrations. Players manipulate Men, Elves and forces of Darkness, competing in the ultimate struggle to control the supreme Powers of the universe! players take turns matching a card from their hand with one (or more) of those lying face-up on the table, trying to capture the most powerful combination. 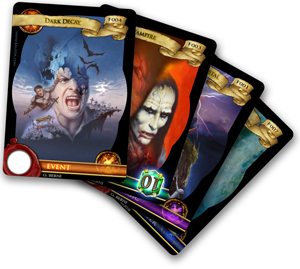 A separate strategically customizable deck allow players to temporarily change some of the cards values or game dynamics to their advantage. Play progresses by rounds, divided into hands in which players play and capture cards to score points and continue until a player or a team wins the game. The game is generally won by the player or team who first scores 11 points and also has a greater total than any other team or players at the end of the round. 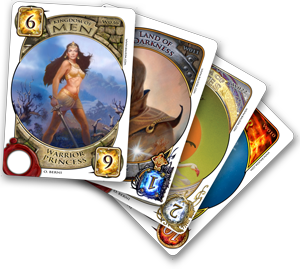 Two separate decks of cards are used in the game: the World Deck and the Fate Deck. Only one World Deck is used in a game, shared between all players, and it always includes the same cards. The standard deck consists of forty cards divided into four suits, with each suit having ten cards ranking in value from 1 to 10. In addition, each player assembles his own Fate Deck. This consist of seven cards freely chosen by the player from his whole collection of Fate Cards, with the only constraint that it cannot contain more than one copy of each. Each and every card in both the World Deck and the Fate Deck have a seal of ownership in the bottom left corner. You can use the white space inside the seal to personalize your cards with your very own signature. It can be your autograph your initials, a symbol or even just a stroke of color, or maybe it can be a die punch mark or a stamp... the possibilities are endless, unleash your fantasy! Whatever you do make sure it will be unique, your personal seal is very important! It is your seal that will let you tell which ones are your own cards after they are mixed up with those of the other players during a game! The most important card is the 7 of Powers - it is worth a point by itself and contributes to all the other three Cardinal points. You should always capture the Fire Dragon card (w007) if at all possible. Even if you expose yourself to a sweep by doing so; it's worth it anyway! Apart from the Fire Dragon and sweeps, the next priority is to capture other dragon cards (7) for the pride, and also sixes, which come in useful if sevens are split. Power cards should always be a priority to collect as well, and finally it does no harm to have the greater bulk of cards, so if at all possible try to capture more than one at a time! Other than that you should always be careful to avoid giving away sweeps, and try to put your side in a position to win sweeps. Winning a sweep is just one point initially, but because it leaves the table empty, the next player has to put down a card. If you (or your partner) can match the card played by the opponent you then get another sweep. This can go on for several plays. It is the simplest form of what is called a whirlwind and can be devastating! One obvious way to avoid giving away a sweep is to leave a total of at least 11 on the table. For this reason you may want to avoid capturing cards which would leave a total of 10 or less. If you leave exactly 11, your opponent may wish not to capture for fear of giving you a sweep, so he plays a card to the table. If you can capture it this leaves 11 again... This is another kind of whirlwind, and work also with four players. Even better than leaving 11 is to leave a smaller number which you know your opponent cannot match. For example, suppose that two 3's have gone, you hold the third 3 and the fourth is on the table. It will then be best for you to not capture the 3 on the table but leave it as an anchor. Your opponent must now play a card and has the additional problem that if he plays too small a card (7 or less) there is a possibility that you may make a sweep on it. Clearly it is good to establish an anchor, and to have cards on the table of ranks which your side controls. For this reason you should lead, or leave on the table, cards which you hold two or more of in your hand. If you play in four, if your partner plays (say) a 5 and your opponent takes it, you should also play a 5 if you have one, because it is likely that your partner may hold the fourth 5. There is much more that could be said about the strategy of the basic game not to mention all the variables introduced by Fate Cards, so keep an eye on the Rule of Power social networks and have fun with our own take on this great game! To view PDF files you need Adobe Acrobat Reader. If you haven't got it yet download it now, it's free!